WOW! It has been awhile since I have posted. I have spent the last few months settling in to a brand new city. I moved across the country to a smaller city in Pennsylvania. It has been a great adventure. I will be seeing a brand new coastline of vintage shopping. With the move my inventory is brand new! I have found a few amazing Mid Century vases, including a Redwing and McCoy! 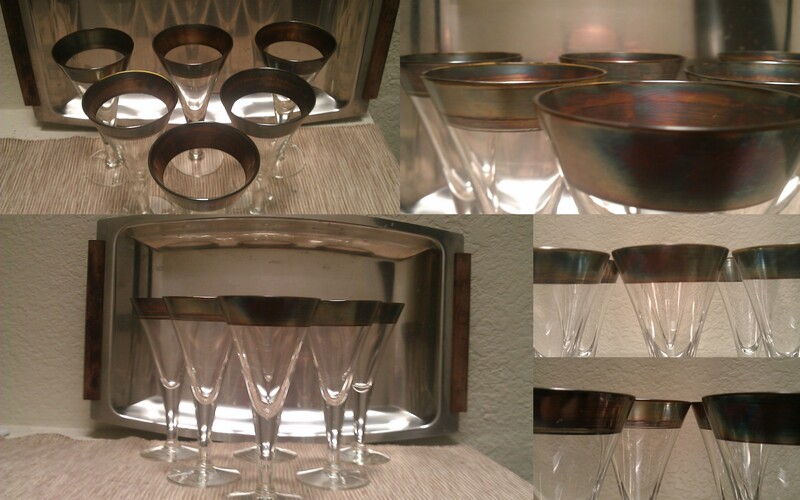 I also found a cool set of 1960’s Martini shaker glasses. They are embossed with classic Cocktail recipes. Very cool set in black and red. Finally I have some lovely women’s scarves that I saved from my previous inventory. With a brand new territory to explore I will be revamping my whole shop with brand new to you finds! Live a Vintage life by visiting JessFindsVintage. Comments Off on It’s been awhile! 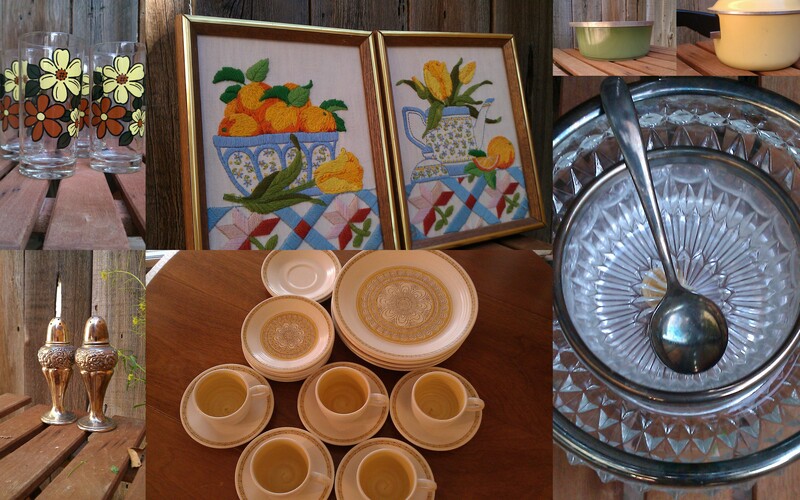 JessFindsVintage has many styles of retro. Check them out!! Four Dorothy Thorpe cordial glass with a Thorpe style decanter. The glass are adorable. Perfect for that sip of liquor or sherry wine. Use for tiny dessert glasses or just display with your other Thorpe collection. They are in PERFECT condition. They have the signature patina that comes with Thorpe pieces. 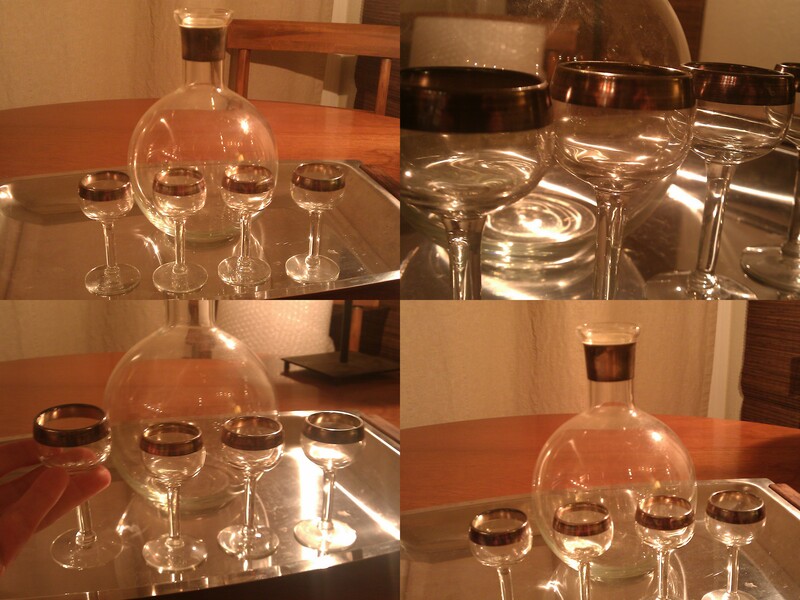 The decanter looks like Thorpe with a silver band neck but the decanter is NOT Thorpe. The bottle itself is a very pleasing round shape with an out cropped rim/lip. It does not have a stopper. It could be used as a decanter or maybe even a vase! Add it to your table setting of Roly Poly glass to tie your functional pieces with your display pieces. The silver band has patina and some wear marks, shown in pics. The decanter-bottle- 8″ tall and 5″ wide at its widest. The opening is 2″.